Craft Stencils - Mini Stencils for Scrapbooking, Furniture, Cards and more! These small stencils are perfect for crafting! You can use these mini stencils for all kinds of creative expression: scrapbooking, homemade cards, stenciled accents, painted embellishments, textile stenciling projects and furniture decorating. We even used these stencils for stenciling food such as pancakes and beverages. 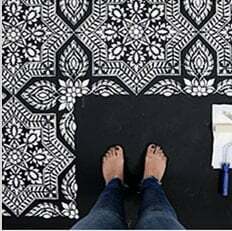 You can certainly use these small stencils for wall decorating as well. Learn How To Stencil - it's a very simple technique!